Gavin Hall has seen Niagara Falls Country Club plenty of times, but it is his intention to leave the course next Saturday in what will likely be his final entry in the Porter Cup tournament as a champion. The 22-year-old recently finished his impressive collegiate career at the University of Texas, and the path to the PGA Tour is calling. But before seeking potential greener pastures, Hall has two months of unfinished business in front of him. The 2016 Porter Cup runner-up enjoyed a successful senior year with a 71.63 scoring average, finishing in the top-11 seven times in 13 events. He was bestowed numerous honors including: 2017 PING All-America Honorable Mention, 2017 PING All-Region, 2017 Golfweek All-America Honorable Mention, 2017 Academic All-Big 12 and 2017 Ben Hogan Award Watch List. His objective for the next two months is crystal clear – close out a celebrated amateur career with strong finishes at three of the biggest events in amateur golf: Porter Cup, U.S. Amateur and Walker Cup. Hall returns to NFCC next week with an impressive career scoring total at the Porter Cup. Entering the 2017 tournament, he is a cumulative 41-under par on the par-70 layout in 20 Porter Cup rounds, with only three rounds over par in his five appearances. He is a leading contender to capture the 59th edition of the Porter Cup, and recently spoke about his last 12 months, unattainable barbeque and the upcoming Porter Cup tournament. Q. What does it mean to you to be playing in your sixth Porter Cup tournament? A. Can’t even believe it’s been six years. This is the one tournament that remains the same year in and out. There always seems to be a buzz on holes 15, 16, 17 and 18. Not another tournament like it for an amateur event; it truly has the feel of a U.S. Amateur final with fans walking down the middle of the fairway on a final round Saturday. The more people the better – I feed off the energy in the gallery. Q. You owned a four shot lead heading into the final round of last year’s Porter Cup tournament, only to come up just short against Harrison Endycott. How did that outcome affect you? Was that experience used as motivation over the past year? A. Harrison [Endycott] flat out won the tournament – let’s be honest. But to hit that many quality shots, I was happy with my ball striking in the final round. I was able to handle the pressure playing in the final group. I think the best part was that it ended up becoming mono a mono between Harrison and myself. Q. You’ve finished inside the top 10 in all five of your appearances at the Porter Cup. What would you say makes you consistently play well at Niagara Falls Country Club? A. The course presents a lot of birdie opportunities. The back nine absolutely fits my eye, having to shape right to left and left to right. NFCC is similar to Mendon Golf Club, which I have plenty of experience at. I never use a yardage book, only play with feel, which is to say I feel very comfortable at NFCC. Q. While you’ve had great success on the majority of holes at NFCC, what is it about the par 4 15th that gives you trouble? A. I played it  really well in 2010 when Peter Uihlein was in my group. Last year I laid up, I gave myself an opportunity, but made par. More times than not, laying up is the smarter play as a lefty. The green is complex, moving back to front. But I feel confident when I get on the tee box. I’m fired up when crossing the road with the fans hooting and hollering. The hole starts a cool final stretch – something that amateur golfers don’t get a lot of in notable tournaments. Q. You’ve stated previously that the weather tends to be one of the variables during the Porter Cup tournament at NFCC. If the wind is up, what do you draw on with your experience to battle through the conditions? A. I’ve seen it all rain, wind, and having to layer up due to chilly conditions. I don’t think it changes the way I play the course. When the wind is up, the greens firm because the majority of the holes are exposed. Shots from the rough become pretty crispy, so it’s critical to stay in the fairway. Q. With 2017 being a Walker Cup year, does it provide extra motivation to win the Porter Cup in what could be your final year as an amateur? A. Winning the Porter Cup has been a goal of mine since I was 15. Obviously, to win will help, but I feel like the Porter Cup title will have so much meaning on its own. It’s been 10 years since [PGA Tour professional and fellow left-handed golfer] Brian Harman’s victory so hopefully I can replicate the result. Q. What would it mean to be selected by U.S. captain John “Spider” Miller and to play at the Los Angeles Country Club representing your country? A. It’s been a lifelong dream. Every amateur golfer wants the chance to represent their country at the Walker Cup. It was absolutely the right call for me to retain amateur status this year for that opportunity. Q. You finished your senior year at the University of Texas a few months ago. Have you had time to reflect on your collegiate career? What did you enjoy the most about Austin and your experiences there? What if anything would you like to have a chance to do over again? A. I went right to Columbus, Ohio, for a U.S. Open qualifier after leaving Austin, so I really haven’t had time to think about it. I don’t think it will hit me until the fall. I had so many great relationships and friends. During my sophomore year finishing second at the Big 12 Championship, junior year winning The Maxwell, and four-time Big 12 conference champions; it was all very special. But the best part of going to Texas is being a part of the Longhorn family and golf tradition. Knowing that I can call or send a text to Mr. Crenshaw, Mr. Kite and many other great golfers to bounce feedback off of is something special. One regret I have is that I never had Franklin’s Barbeque. It was a two-hour plus wait every time I tried to go there. Q. You carded a second-place finish during the stroke play portion of the U.S. Amateur Championship last August, then a suffered a first round loss in match play, what did you learn from that experience, and are you looking forward to playing at Riviera Country Club this August at the U.S. Amateur? A. To be on a championship golf course (Oakland Hills Country Club in Michigan) for an amateur gave me confidence, but I’d much rather have gone further in match play. Riviera is probably one of my favorite golf courses in the country. The unique set-up really suits my eye. It should be quite the test; it’s so hard to play from the rough. I think it’ll be great for the television audience as well. Having the primetime schedule on FOX-TV should make it a special U.S. Amateur Championship. Q. You’ve achieved success at every level so far, what are some areas of your game that you find yourself constantly tweaking while looking for improvement? A. I’m always working on wedge game and distance control from 135 yards in. Putting, chipping – parts of the game where you’re able to score significantly. Everyone can put a move on the ball, but to be consistently good around and on the green is another level. Q. Rarely in this game (as in life) is there a straight line to success, undoubtedly there will be stumbles along the way. As you have matured as a person and as a golfer, what interactions and/or relationships have you cherished to keep you focused? A. I keep a fairly close circle. I’m blessed to have the family that I do. I’m so proud to be close with them; they always have my back no matter what. I’m fortunate to have close people in Rochester as well. A lot of my friends are older, three to four years older. 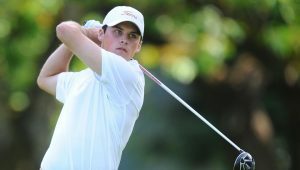 Beau Hossler and Dominic Bozzelli are two of my closest friends. Q. As one of the top-ranked amateur players in the world, what guidance would you offer younger amateur players who seek to follow in your footsteps? A. I would say the biggest thing is hard work. There have been so many sacrifices that I’ve had to make, there is no real shortcut. I was hooked on the game in my early teens – I wasn’t forced into the game. I play a lot of different sports as a young kid. But all the choices I’ve made have been my choices which I believe has allowed me to learn from my mistakes but also enjoy the success I’ve had to date.